A young woman from Lowestoft who's been left scarred for life in an acid attack by her ex boyfriend has now written a book to help others spot the signs of an abusive relationship. 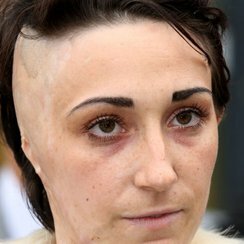 Adele Bellis lost an ear and was left partially bald after Anthony Riley got someone to throw acid at her as she stood at a bus stop in Lowestoft back in 2014. He was jailed for a minimum of 13 years. Miss Bellis who's now 24 has written a book about her ordeal - called Brave - which is released today. She told Heart: "When you're in your first relationship you don't really know what's normal and what isn't, so young people need guidance as to what is and isn't acceptable." She also hopes to go into schools and educate young people on abusive relationships.